Much more than just capturing photos and memories travel photography is also about connecting with the people and gaining a deeper understanding of the cultures and the unique social fabric of each destination. Travel through one of the most photogenic countries in the region to capture the unique faces and landscapes in some of Myanmar's best-loved destinations. Boasting more than 1,000 recognised bird species, Myanmar is gaining a reputation as a hotspot for birding enthusiasts. Spend an early morning on scenic Inle Lake looking for rare birds including the Glossy Ibis, Plaintive Cuckoo, Sarus Crane and Black-winged Stilt. 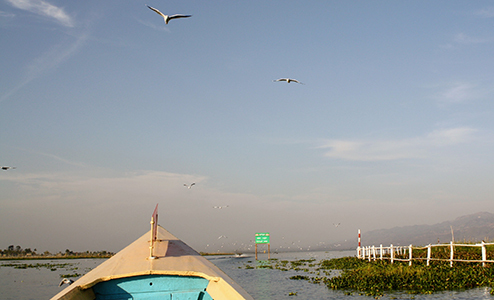 Established in 1985, Inle Wetland Wildlife Sanctuary within Inle Lake is home to some 255 woodland and 90 wetland bird species. 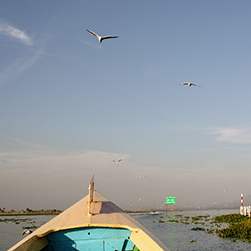 Part of the UNESCO World Network of Biosphere Reserves, the shallow lake, surrounding marshland and farmland make the ideal habitat for many native and migratory birds. Cruise past stilted villages and floating gardens to some of the more remote locations around the lake with exceptional opportunities for birdwatching and wildlife photography. All the elements that make Luang Prabang one of Southeast Asia’s most beautiful towns also make it a photographer’s dream, including its valley location surrounded by scenic rivers, its diverse architecture marrying modern, colonial and traditional elements as well as its warm, friendly people. 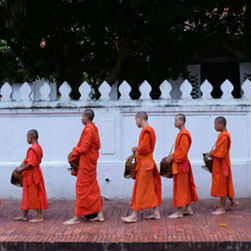 Spend a full day with an award-winning photographer and filmmaker based in Luang Prabang. His hands-on workshop is designed for the beginner photographer with the aim of quickly achieving better results by applying tricks of the trade, including fundamental compositional rules. 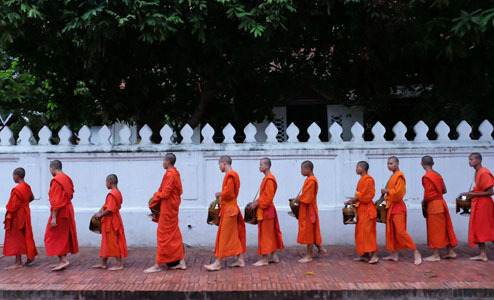 Visit some of the photographer’s favourite spots, including a temple and a local village, and learn about Luang Prabang’s culture and history while capturing stunning images under the instructor’s guidance. Other potential subject matter includes almsgiving to the monks, an early morning market and portrait or landscape photography. 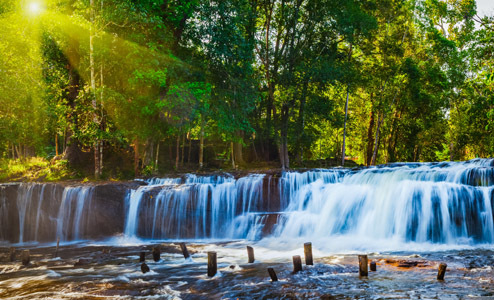 About 50km (30mi) from Siem Reap lies Cambodia’s most sacred mountain, Phnom Kulen. 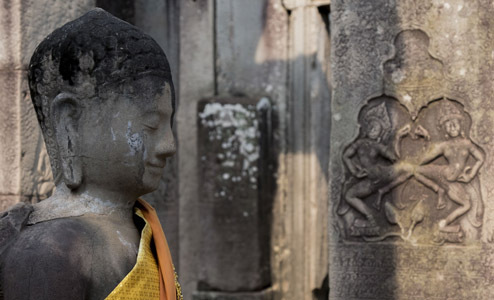 It was here in the 9th century that Jayavarman II declared himself a god-king, the first ruler of the Khmer Empire which lasted until the 15th century. Spend the day photographing the intriguing contrasts between natural and man-made wonders at this sacred site, including 1,200-year-old structures, the River of a Thousand Lingas featuring mesmerising carvings on the sandstone riverbed, a gorgeous waterfall featured in the “Lara Croft: Tomb Raider” movie, and the country’s largest reclining Buddha. On the way to Phnom Kulen, capture images of the pastoral Cambodian countryside with quaint villages and rice fields providing photogenic backdrops to rural living. The Angkor Wat Temple Complex is truly one of the most inspiring destinations in the world, but to capture its ancient mystique can be challenging even for professional photographers. Spend a full day learning and practicing photography techniques in 6-7 different locations within the complex. Start very early morning to capture the iconic sunrise over Angkor Wat’s five spires, using the billowy clouds tinged with early morning sun to create atmospheric and moody images. Angkor’s detailed sandstone carvings and writings lend themselves to close-up shots or the black and white treatment. The ancient architecture is also superb for image composition with many opportunities for frame-within-frame shots, playing with light and shadows and experimenting with artistic shallow depth of field. 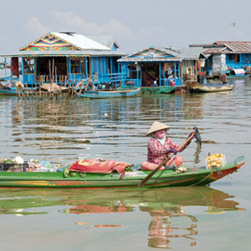 One of the largest freshwater lakes in Asia, there are over two million people who live and work on and around the Tonle Sap. Spend a full day putting your camera settings through its paces to photograph this challenging yet beautiful mix of landscapes, animals and people. Practice your wildlife photography in this rich ecosystem that is home to more than 100 varieties of water birds, as well as crocodiles, turtles, macaques, otter and other wildlife. Capture portraits and people shots at the lake’s monasteries, floating villages and vibrant local market. Landscape photographers will especially enjoy taking wide shots of the scenery from a village perched on 10m (33ft) high stilts, looking across the water during the late afternoon golden hour. Inscribed as a UNESCO World Heritage Site in 1993 for its stunning temples, imperial buildings and royal tombs, some of Hue’s beguiling charms are actually best photographed where fewer tourists go. 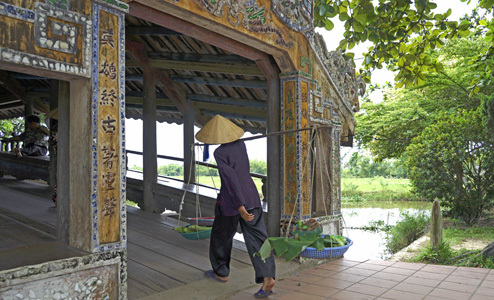 Spend the afternoon capturing images of Hue’s people and places at the 15th century village of Thanh Toan with its small local market providing a host of colourful backdrops. 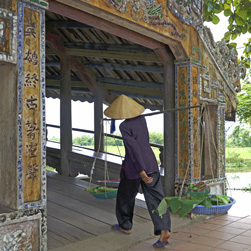 Thanh Toan is also the home of an ancient covered bridge. Its built-in bench seating for weary villagers returning from the nearby market offers excellent opportunities for portrait photography, particularly of the town’s older women who flash toothsome smiles showcasing betel nut-stained teeth. 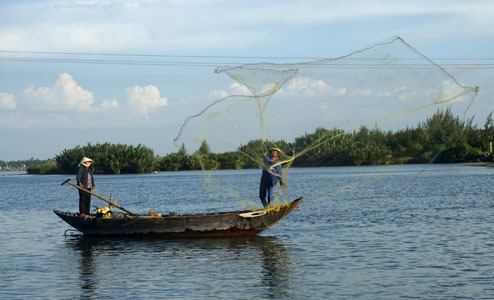 Also visit tranquil Vong Canh Hill for incredible panoramas of the Perfume River against the backdrop of the scenic mountains. 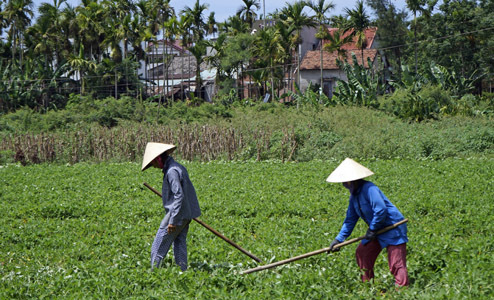 The countryside of Hoi An comes to life in the early hours before sunrise. The warm glow of the golden hour combined with the purposeful activities of farmers and fishermen make for ideal landscape and portrait photography. 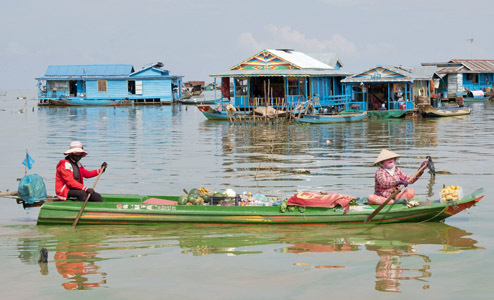 Join a locally-based international photographer as he takes you to his favourite spots, capturing colourful scenes of fishermen bringing in their catch and intimate portraits of Hoi An’s open, friendly people in their everyday environment. Benefit from strong relationships developed over time between photographer and villagers, enabling you to get up close to practise portrait photography while taking in tips on composition and lighting. Later in the morning, return to town for coffee where your photographer-guide will review and comment on the images you have captured. 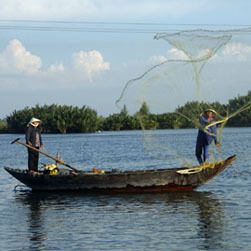 The Red River Delta surrounding Hanoi is renowned for its rich, fertile land, fed by the alluvia from the Red and Thai Binh Rivers. 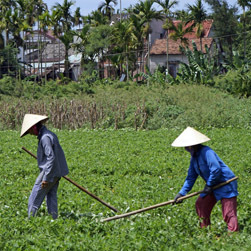 It comprises 25% of Vietnam’s vegetable-producing area and is a major factor behind Hanoi being one of the world’s most successful urban farming areas where 45% of all produce sold in the markets is grown inside the city limits. Spend a tranquil half day photographing some of Hanoi’s urban farmers at work, just 15km southwest of the city centre at a small village with a long tradition of floriculture. Capture timeless scenes of farmers working at their flower and vegetable gardens, clearing the land, watering and cutting flowers and vegetables, and loading up motorbikes for a trip to the market.